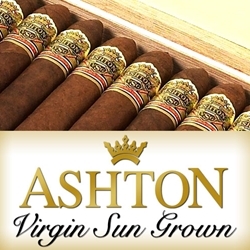 Ashton Virgin Sun Grown or VSG are hand-rolled premium cigars that are constructed with premium Dominican tobaccos hand-selected from the finest plants and aged between four and five years, used for the binders and fillers. What makes these hand rolled cigars so unique and popular are the wrappers that bundle up each one of these premium gems. Ashton Virgin Sun Grown cigars have tobacco wrappers produced from super high grade Sumatra seeds on a private estate in Ecuador. Each tobacco plant is grown under the region’s natural cloud cover that serves as a delicate sunlight filter. This unique maturing process is what gives the tobacco leaves their distinctive rich flavor. Every Ashton VSG premium cigar listed here at our online cigar store will give you a smooth cedar taste smoking experience, joined with eventful espresso flavors of dark chocolates. A perfect hand-rolled premium cigar that makes a great addition to your humidor. The Ashton Virgin Sun Grown line are hand rolled premium cigars that make an excellent choice for any cigar connoisseur. Smokers Discounts has made it easy and affordable to buy premium cigars online. A variety of sizes and flavors are listed below at our discount online cigar store. Each of these styles are in stock and available. Call us for more details!